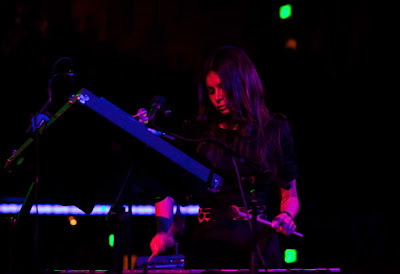 Blogtown: Hope Sandoval & The Warm Inventions at The Mayan! Hope Sandoval & The Warm Inventions at The Mayan! "I feel tingles," is how my brother, Paul, explained the anticipation he (and the super long line waiting to get in outside The Mayan Theater in downtown L.A.) felt last night to FINALLY be seeing Hope Sandoval live. He has loved her - and I mean LOVED her - since her Mazzy Star days in the 90's, and had never seen her in person. Happy Birthday, buddy - got tickets to Hope Sandoval in October! And the night had finally arrived. If you didn't at least make out to "Fade Into You" back in the day, you really should turn in your Player's Card. That's when Mazzy Star really made their big splash, but one album after that, they were done. Hope reappeared with her band, The Warm Inventions, and released an excellent album, Bavarian Fruit Bread, back in 2001 ... but that's been quite a while now. They released their new one, Through The Devil Softly, last month. It carries on the Dreamy Shoe Gazer genre perfected by Hope and anyone she's ever played with, and I love it. You're never going to play it to get hyped up for a night out on the town, but if you're anywhere dark and candle-lit, with someone you really like ... (or better yet, LOVE) - it's on. That's how her music makes you feel, anyway. We were somewhere dark and (faux) candle-lit last night - The Mayan. What a great venue. I hadn't been there in ages, and forgot how funny and Epcot Mayan Temple it is. It's trippy to walk around pre-show with a cocktail and imagine all that's gone down in the space, from Mexican Lucha VaVoom Wrestling to last night's love lullabies. 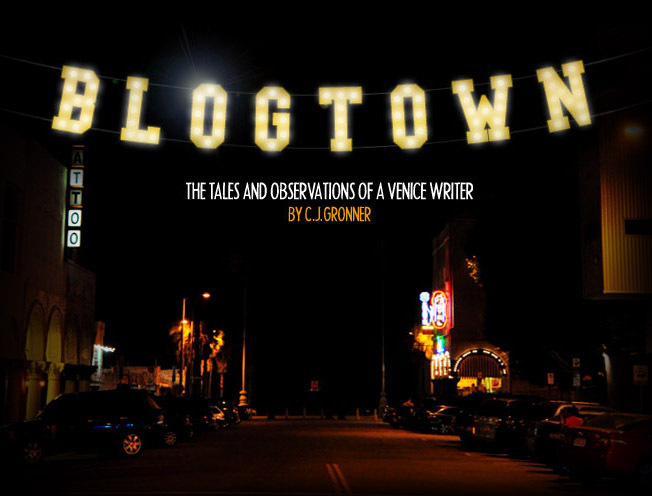 A perfect place to hear them in too, considering Ms. Sandoval's East L.A. roots. Suki Ewers and her band opened the night, and you can really tell she used to play guitar in Mazzy Star. I'm always a bit mixed on having a band open that sounds SO much like the headliner - it can make for a kinda somnambulist night. But then I saw my old pal, Abe Smith, playing guitar for them and that perked us up. Suki did not introduce the band, and they ended abruptly, so I only know what I know from Abe. They were really good, but I would try and vary up the sound a wee bit away from Hope's so as not to draw such stark comparisons with someone that everyone in the place is dying to see. The next opening band was Dirt Blujean, which is basically the Warm Inventions sans Hope and Colm O'Ciosoig (of the influential Irish outfit, My Bloody Valentine), her musical partner/ drummer. They were very good too, with a lot of instrumentals and slide guitar ... but it was actually a lot like sitting in a band's rehearsal space and watching them jam. Which is great, but lulled the crowd vs. building up the buzz. A guy in front of me on the balcony was sitting there reading "Tristessa", if that tells you anything. Then the room went wild for Hope just walking on stage. At least I think she did. She performs in the total dark with just a red bulb somewhere around her to see her Xylophone set-up, so I wasn't even sure she WAS on stage yet. But then she said, "It's good to be back home. It's really bright up here." - which it was not. At all. I was chatting with Abe, who I hadn't seen in ages, so I missed most of the first song (sorry), but I think it was "Fall Aside" from the new album. People were just eating it up, yelling, "WE LOVE YOU, HOPE!" every other pause. Anyway. Hope and the band next played "Thinking Like That", with her in the total dark. I heard some people at another show wanted their money back, thinking she wasn't even there and it was a recording. She DOES sound more like she does on her albums than almost anyone else I can think of - not an easy task. But she WAS there, I saw her skin-colored legs between her black boots and dress. "Blanchard" was next, which I love, it's so lush. Hope jammed the Xylophone on this one, with firm command of the instrument. "There's A Willow" featured a plaintive harmonica solo by Hope, which was met with whistles and hoots. Her time away did nothing to dispel her fan's love, that much is clear. The fans also love an oldie, and they got "Lose Me On The Way" from the last album. "I've got it going on," goes the chorus, and indeed she does. "Charlotte" was also a favorite from the last album, and the line, "She's got a smile like a flower", has always made me smile. How cool to see her sing it all live, honestly. It's interesting because Hope's voice is so self-assured, I wish I felt like she herself was. It's an odd mix of feelings one has about her, as you feel both protective and timid of her all at once. It's all just so breathy, lilting, melancholy, dreamy and rad ... it's not hard to understand why at this point Paul insisted on smushing up front closer to being somewhat able to see her face. So we did. "Wild Roses" led into what I think is my favorite from the new album, "Trouble". It's jazzy and confident ("Don't talk to me, if you're not on your knees ..."), and begging for a seduction to accompany it's listening. Seriously. Phew. Then it was "Bluebird", which opened with Hope's hand on a little mouse-pad, doing trippy sound effect stuff from it. Oh, and the whole time there was a screen overhead playing exactly the kind of images you would want above Hope Sandoval: ballerinas, flowers, uh, some war looking footage, perhaps lava, old silent movie faces, and back to dancers. At this point, my brother and I both noticed that the scraggly-bearded homeless guy from outside who had been asking for an extra ticket - that we assumed was to re-sell for whatever - was standing right near us, rapt as anyone else there. That is actually the lasting image I took from the show. That and Paul's gaping maw. "Suzanne" was another gift from the old album, and everyone ate it up. Then came, "For The Rest Of Your Life", the most haunting tune (complete with ghosty "Ooo-ooo-ooo" part) from the new one, that was to be the last song of the regular set. It was the hardest rocking of the bunch too, with a whole cacophony of sounds, lit up by Hope on the Xylophone. I've never seen the old X is for Xylophone get so much glory in one evening. And it's a perfect fit. The last note died out and Hope simply said, "Thank you, Good Night" and walked slowly off the stage. It took quite a while for Hope and the band to return for an encore, the rhythmic clapping swelling and ebbing with the energy of the assembled. "HOPE, COME BACK!" rang out, from one of the I Love You Hoper's, probably. Then come back she did, and said, "I want to say hi to my Dad. He's here tonight. Hi, Dad." That was met with happy yells for the Man that sired this shy, mysterious, and obviously beloved singer. And it was the most she said all night. The last song on the new album is "Satellite" and it was the first of the encore. I wish she put her lyrics in the c.d. envelope, because I love the poetry of her songs, and sometimes the precise words can get lost in all the sounds. But it was beautiful, like everything of the night. The MOST beautiful to me, was the very last song, and my very favorite of the last album, "Feeling Of Gaze". It's very cello-heavy, and just plain gorgeous. The two guitars, bass, drums, keys, sound effects and Hope all coalesce in this one to be something from another, more ethereal world. The lyric, "Gonna play my favorite song, gonna play it all night long ..." was wishful thinking, as it had to end sometime. Once again, at the dream's conclusion, Hope just said, "Thank you, Bye. ", and floated off into the darkness. As did we. Paul was literally gasping for air, and cracked me up as the first thing he could speak to say was, "If I had Hope Sandoval come to my room and sing little things to me, I'd never have to do anything again. I'd be happy to just lie there and eat Jell-O." So if that is an appealing offer, dear Hope Sandoval, your cool manager Frank has my contact information. Thanks for a wonderful, idyllic show for me, and a dream come (well, almost) true for my brother. **Photo of Paul sneakily taken by me. Hope Sandoval is on my mind! She IS the most beautiful being on this planet. That voice, those eyes, those lips, that hair, those boots, that dress.... Ladies, homework. Sounds like fun. I bummed I missed it. Norman Ollestad: Venice Guy/Best-Selling Author. The Undisputed World's Greatest Wino! Venice: Where Art Meets Crime - FIGHTING! Lidia's Pupusas - Meal on the cheap! Suzy Williams, The Venice Songbird! FINALLY!! Venice gets itself a Skatepark!